BBC NEWS | UK | Is this the nicest place to live in Britain? Bournville. Just the way it rolls off your tongue makes it sound a nice place to live. 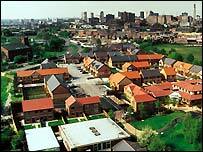 And yet at first glance it's just another red-brick estate in the suburbs of Britain's second city. But academics say the Birmingham estate built by chocolate baron George Cadbury is much more than that. It is quite simply one of the nicest places to live in Britain. There's no end of research on what makes a bad neighbourhood. But what about what makes a good place to live? The Joseph Rowntree Foundation has tried to answer this question by funding research into Bournville, long reputed to be neighbourly, peaceful and, well, nice. Bournville was born in the last years of the 19th Century when George Cadbury, a classic Victorian philanthropist, decided he wanted homes next to his factory south-west of Birmingham city centre. He said the estate should "ameliorate the condition of the working-class and labouring population... by the provision of improved dwellings, with gardens and open space to be enjoyed therewith". A century on, the model village is a large garden suburb of 1,000 acres, 7,800 homes and 120 acres of open space. At the heart of the area is Bournville Village itself - to all intents and purposes a slice of rural Britain in the heart of a city, complete with village green, shops and a war memorial. All the homes have big gardens on wide roads, though the houses themselves are neither too grand nor too small. Some 40% of residents rent from the charitable trust, but they are intermingled with owner-occupiers creating a social mix you don't often find. What the researchers found was that Bournville's success comes down to a seamless mix including quality homes, neighbours from different backgrounds, services and open space. Factors like these (and perhaps the sweet smells of a chocolate factory) encourage residents to more actively commit to an area's prosperity, creating a virtuous circle of neighbourliness - also known as social cohesion. On top of this, the Bournville Village Trust exercises an unusually high level of control. Residents can't just put up a satellite dish without permission. Furthermore, they cannot buy alcohol within its boundaries. Not that it seems to bother anyone that pubs were not part of the Cadbury vision. The Rowntree research found that across a range of national indicators Bournville residents were simply happier. Tenants were twice as likely to describe the area as "pleasant" than those elsewhere. They even make fewer complaints about the thing we all fear most - neighbours from hell. So is this the epitome of Arcadia transplanted into suburbia? 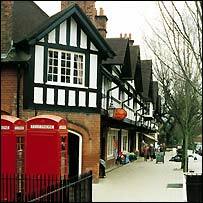 "This was the first purpose-built community in Britain," says Alan Shrimpton, director of estates for the Bournville Village Trust. "George Cadbury wanted to build good housing for all people. He sat down and asked himself how people wanted to live. "I don't think anyone got it as right as Cadbury did." The trust rejects suggestions that Cadbury's vision has come at a price, such as the right to buy a bottle of wine. Instead, says Mr Shrimpton, people willingly enter a social contract with their neighbours, the trust and wider community. "These kinds of rules are supported by the residents themselves," says Mr Shrimpton. "The last time this was discussed the consensus was the drawbacks of allowing the sale of alcohol would outweigh the advantages. "If you want to live in harmony with your neighbour, there is sometimes a price to pay. It seems at Bournville people want to pay it." David Smith, his wife and two young sons, are among the new-comers who are happy with that social contract. He loves it so much he says he will probably stay forever. "We only used to live a few miles away in Selly Oak," he says. "But we've now found a real community spirit." Mr Smith runs a community website (see internet links) to link up all the residents' groups, friends, neighbours and societies, something he was encouraged to do by the atmosphere of the area. 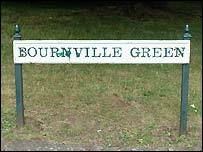 "People just tend to be generally friendly in Bournville," he says. "There are newsletters and notice boards of what's going on. I hadn't seen that anywhere before." The Trust concedes its one major mistake was Shenley, a multi-storey post-war project which abandoned the Cadbury principles and has been beset by problems. It also accepts that it needs to do more for the young and tackle a social mix that could worsen as the stable population ages and the highly desirable private homes soar in value. But others are trying to learn from Bournville, the most recent being the Prince of Wales' own Poundbury community in Dorset. Meanwhile, Joseph Rowntree's own model village just north of York, New Earswick, continues to thrive a century after it was founded. Rosemary Shutt of the local Bournville Historical Society says the most important thing others can take away is the essence of what makes a community work - collective experience. "A lot of the old people who live in Bournville went to the school in the village centre, worked for Cadbury's and still live here," says Mrs Shutt. That means there is a real sense of shared memories. "I think if George Cadbury came back today, he's still be happy with Bournville. There's probably more litter, but the spirit of Cadbury is still here."